Huh? You read it correctly. Blogging from the beautiful Homewood Suites Hotel. Why, you ask? 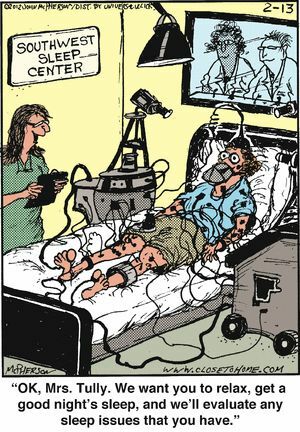 I am having my somewhat annual overnight sleep study performed. What’s better for a person that has trouble sleeping than to hook them up to 30 plus wires all over their face and body, know that they are being watched and listened to all night (EEK!) and think they will actually sleep? Having done this test a few times already, I feel like I am an expert. This, however, is my first time doing it in a hotel and not a hospital. At first, I have to say, it felt a little shady when they told me to come here. But, I have to tell you, it is pretty nice, all things above considered…wires…people watching, etc. I packed with me my favorite pillow (squishy – don’t judge…my pillow has a name and I love her) and my cupcake blanket to help me to feel at home. I hope they don’t mind that I play Crazy Kitchen on my phone till I get sleepy. Somehow I think they will frown on that activity and this activity…but I’ll be brief. I have already been diagnosed with Obstructive Sleep Apnea. And I am supposed to use a CPAP machine. Do I use the CPAP machine? That would be a BIG hell no! First of all, have you ever seen one? I feel like freaking Darth Vadar wearing it. Oh yea – good night, Tim. I’d kiss you good night but I have this contraption stuck to my face. Second, I have very sensitive skin. I have tried several different masks and all of them have rubbed my skin raw. BUT, with all that said, the last time I went to my pain management doctor, he said I had to have another study done because if I still have sleep apnea and I am taking one of the meds I am currently on…wait for it…I could die in my sleep. Well OK then Mr. Doctor, why don’t I just go ahead and have that test done again? I will have to wrap as the nurse just came in and gave me the evil eye and because I don’t have my dragon. I think Crazy Kitchen is out because they are not loving my phone activity. More to come tomorrow. Remind me to tell you about Pill Pack. I think I might love them! Not at all…lol! Between the feeding tube, drain bag, wires and pulse ox…felt like I was sleeping in a ball of twine. I see a nap in my near future. Love you bunches!! Teddy had a sleep study once, and I was amazed that he fell asleep. Guess who did NOT fall asleep? Dan should probably have CPAP as I sometimes have to poke him when he stops breathing. But, I guess he has me, sleeping with one eye open, so why deal with the Darth Vadar apparatus? To sleep through it! Good for him! And your probably right about the CPAP…what if one night you actually get a good nights sleep?